Emory Maxwell has come home to the small town of Sweetness, Georgia, with one goal in mind—to get his childhood sweetheart Shelby Moon to marry him. They've been in love since the second grade, but Shelby's father is determined to keep his daughter in Sweetness, not moving around the country as a soldier's wife. No matter what she chooses, Shelby knows she'll hurt one of the men she loves. Get ready to fall in love with the town of Sweetness, Georgia, in this prequel to Stephanie Bond's Southern Roads trilogy. Honestly, I was expecting this story to be awful based on other reviews I read. But I thought it was well written and well formatted. It did exactly what it was supposed to do… whet my appetite for the upcoming series. 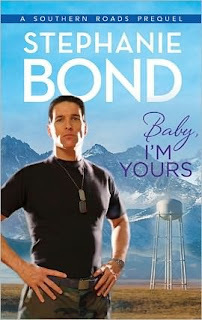 I’ve gotta say, Baby, I'm Yours was the best short story I’ve ever had the pleasure to read. And even though it was short (8 chapters), I felt like I knew the main characters well enough. So much so, I felt what they felt... my emotions were everywhere just like theirs were. Make sure to have the Kleenex handy! Especially for chapter 7. I can’t think of any faults really. I loved this story too much to go looking for bad things, and nothing popped out for me to trip over. Hmm, the cover was kind of ‘meh’ for me though. But since it was an ebook it gets a pass. Overall, it was a truly sweet and moving story. The shortness of it works well for me, meaning I can get the ‘feel good’ mojo from it quickly in the future. Always a plus since I read so slow.